Weave under a historic bridge and clamber atop Goose Rock, then finish the day in the Skagit Valley’s new outpost of Chuckanut Brewery. This four-mile hike takes you along the beach, through the forest and up to one of Whidbey Island’s highest points. Several trails within Deception Pass State Park connect with the Goose Rock Summit Trail; the route described below forms a lollipop with a short loop and an out-and-back segment along the well-maintained North Beach Trail. There are a couple sections of moderate incline, but overall the hike is quite mellow and suitable for most ability levels. FACILITIES: Parking and restrooms are located at West Beach near the Cranberry Lake swimming area. The parking area was nearly empty on a recent Friday morning but can fill up quickly on sunny weekends. Arrive early to beat the crowds. THE ROUTE: Follow signs at the north end of the parking area for the amphitheater and North Beach Trail. The trail dips into the forest but there are plenty of clearings to enjoy the view. During low tide, you can hike along the beach for nearly a mile, rejoining the trail at Macs Cove. Even when the tide is in, it’s worth finding one of several side trails that lead to the water and taking a moment to admire the view of the Deception Pass Bridge, constructed in the 1930s with funds from the Works Progress Administration, rising above the turquoise water. From here, the trail rises slightly and goes directly under the bridge. (If you want to check out the view from above, take a short staircase up to the highway.) Continuing beyond the bridge, you’ll soon come to two forks in the trail; stay left at both and follow signs for the Goose Rock Perimeter Trail if you plan to hike the loop in a clockwise direction. As the trail skirts along Cornet Bay, you’ll find views of Mount Baker and other North Cascades peaks on a clear day. After dropping down toward the bay, look for a large sign marking an intersection with the Summit Trail. Turn right, and begin the only significant climb of the hike. Near the top of Goose Rock, you’ll pass through an area known as “the Balds,” a series of hills that were scraped down to the bedrock after major recession of an ice sheet some 11,000 years ago. It’s taken that long for a thin layer of mossy vegetation to return to the area, so tread carefully. 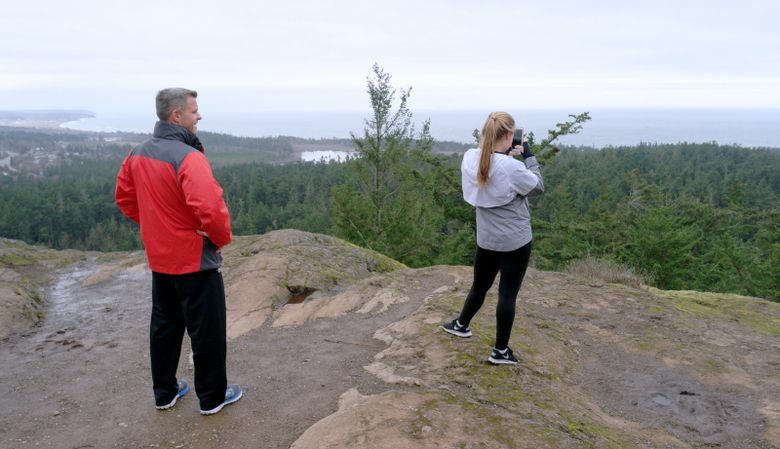 At the top, your reward includes a birds-eye vantage of the state park and sweeping views of the Strait of Juan de Fuca, San Juan Islands and nearby Oak Harbor. On the day of my hike, training flights for Navy jets disrupted an otherwise peaceful lunch but were an interesting visual sight. Although the flights have caused controversy with residents in recent years, the people I encountered told me the noise comes and goes and usually isn’t present for more than a couple hours a day. I guess my timing was off. To return to your car, continue along the Summit Trail as it descends the other side of Goose Rock, then connect with the Perimeter Trail near the bridge. Retrace your steps along the North Beach Trail, or, if the tide is out, enjoy a leisurely stroll along the beach. RESTRICTIONS: You’ll need a Discover Pass to park ($10 for the day or $30 for the year, plus possible transaction fees). Deception Pass State Park is open from 8 a.m. to dusk in the winter and 6:30 a.m. to dusk starting in April. Dogs are allowed on leashes. DIRECTIONS: From Seattle, take Interstate 5 north to Burlington and head west on Highway 20, following signs for Deception Pass and Whidbey Island. About one mile after crossing the Deception Pass Bridge, you’ll come to a traffic signal at the park’s main entrance. Turn right and continue driving along Cranberry Lake toward West Beach. The North Beach trailhead is located at the north end of the parking lot, by the amphitheater. 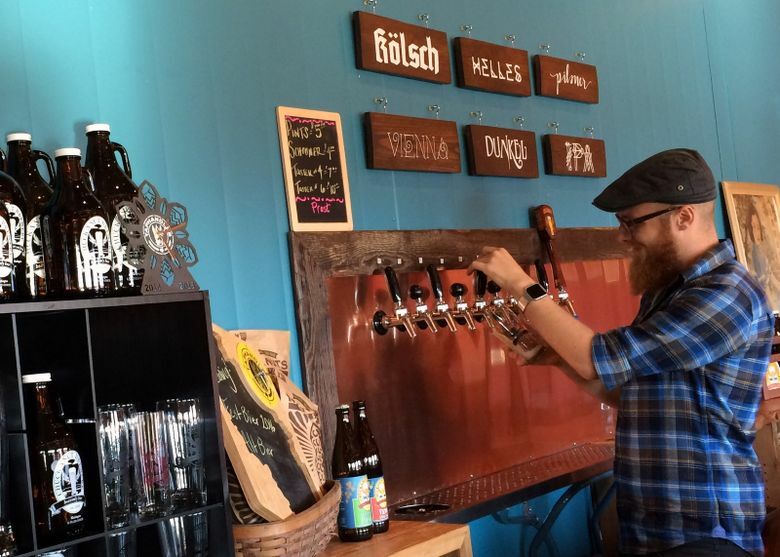 The delightfully named South Nut opened last fall, the second tap room for Bellingham-based Chuckanut Brewing and one of the latest additions to a growing number of breweries in the Skagit Valley. The South Nut features a 20-barrel brewing system and has enabled Chuckanut to dramatically expand its production capacity. It’s a fresh break from the typical IPA-heavy lineup, with an interesting selection of German-style beers. During my visit, I sampled an Alt from the standard tap list and a Rauch (smoked) Marzen Lager seasonal. Both were tasty and refreshingly distinct from what’s found at most Pacific Northwest breweries. If the hike has left you especially parched, order a liter stein for $9 (and perhaps let someone else drive home). Hours are 3-7 p.m. on Monday, Wednesday and Thursday, and noon-7 p.m. Friday, Saturday and Sunday. Closed Tuesday. 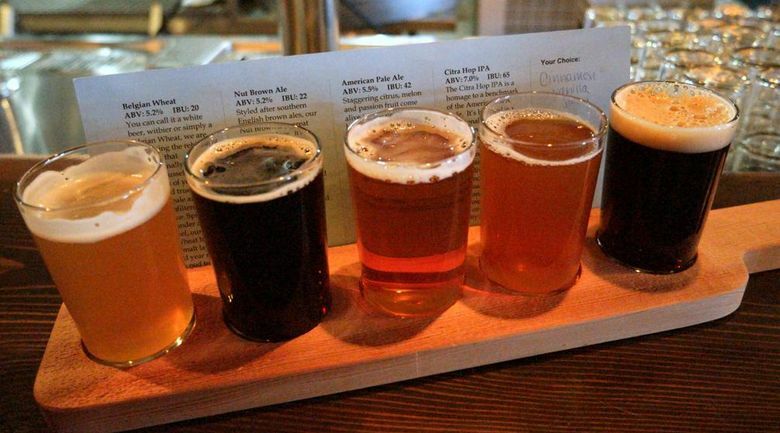 • The brewery serves light snacks including hummus and crackers, sliced salami and peanuts. Food trucks are typically parked outside on weekend afternoons. Outside food and children are both welcome. • Tulip season is just around the corner in the Skagit Valley, bringing traffic headaches along with picturesque blooms. Check the traffic reports before you leave and pack your patience on busy weekends.